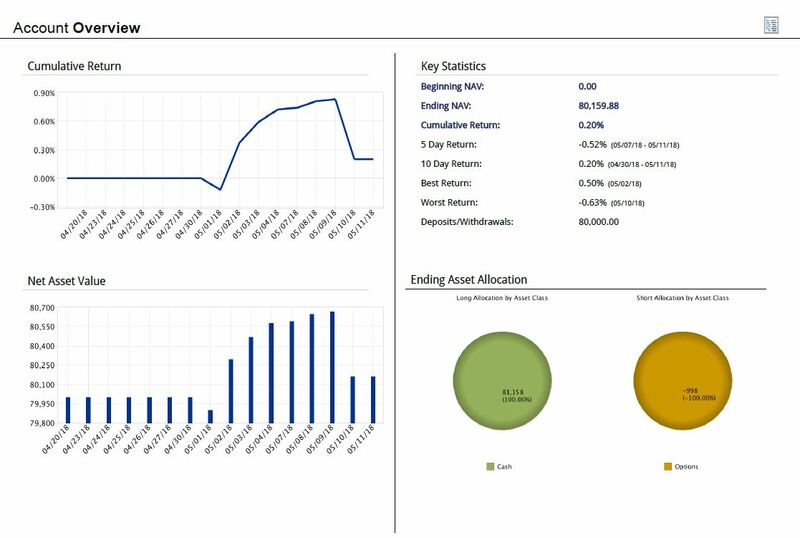 In the last part I have described the basic principles of short-call strategy trading in connection with inefficient ETFs. 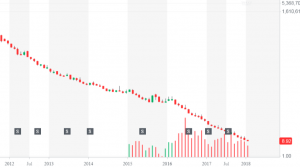 I have noted that in a situation where the price of the ETF reaches a low level, there might appear a so-called reverse split (the conditions under which it occurs, are usually described in the fund´s manual, but mostly they are described relatively vaguely – often in the sense that “can occur in a situation where the ETF price is below certain value”). The figure below is the VXX graph, and further below, there is the UVXY chart, with the reverse splits marked with a square and the letter “S”. As you may have noticed the reverse split may occur also twice a year. As a reverse split, we can describe the situation where a company/fund reduces the total number of shares in a certain ratio, and in the same ratio, the price is increased. 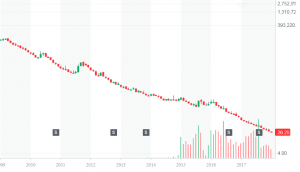 This is the opposite of a classical split, where, on the contrary, the company increases the number of shares, and the price of these shares decreases in the set ratio. In simple terms, the price rises x times, and the number of shares is decreased x-times. The higher price has its reason – on one hand it is quite practical – no one wants to short the ETF, which is worth, for example, 1 USD. Furthermore, from the option point of view, strikes are typically 1 point apart, ie at an extremely low price the options would practically lose its sense, their division would not be sufficiently “sensitive”. Another reason for the “reverse” is that many big players on the market/fund, etc., are not allowed to trade instruments whose value is, for example, less than $ 10. 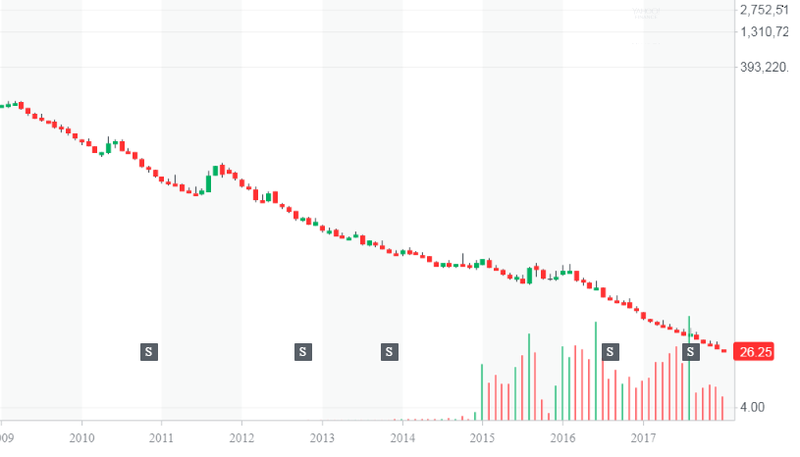 And in the case of shares, a NASDAQ stock exchange can delist the titles whose price is under $ 1 for a certain time (although this rule was not applied in years of the crisis 2008-9). Here is basically very simple. You hold shorted “shares” – eg 400 pcs of the VXX instrument, which are having value 10, for example. Then the reverse split 1: 4 occurs, so the price jumps to 40 on the next day, but the trading volume (nominal value) stays, so you do not hold 400 ETFs, but only 100 pieces. Here it is different. You do not have to worry about some kind of “splitting” the option, dividing profits, settling, etc. After the reverse split of the original option occurs (linked in our model to, for example, value 10), the options remain available on the platform, but be careful! – only in close-only mode. So, you can only close your position, you cannot enter to the new trade anymore. 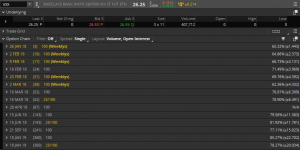 You can, of course, open new trade with options that are linked to a new reversal (value 40). 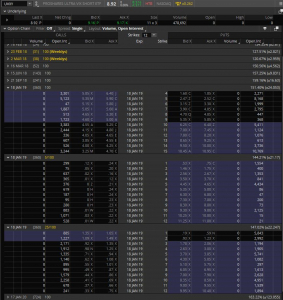 But be careful, however – these options are typically available only after several days the split occurs, and furthermore, the first day are connected with the liquidity problems and large bid-ask spreads, especially for longer expirations. 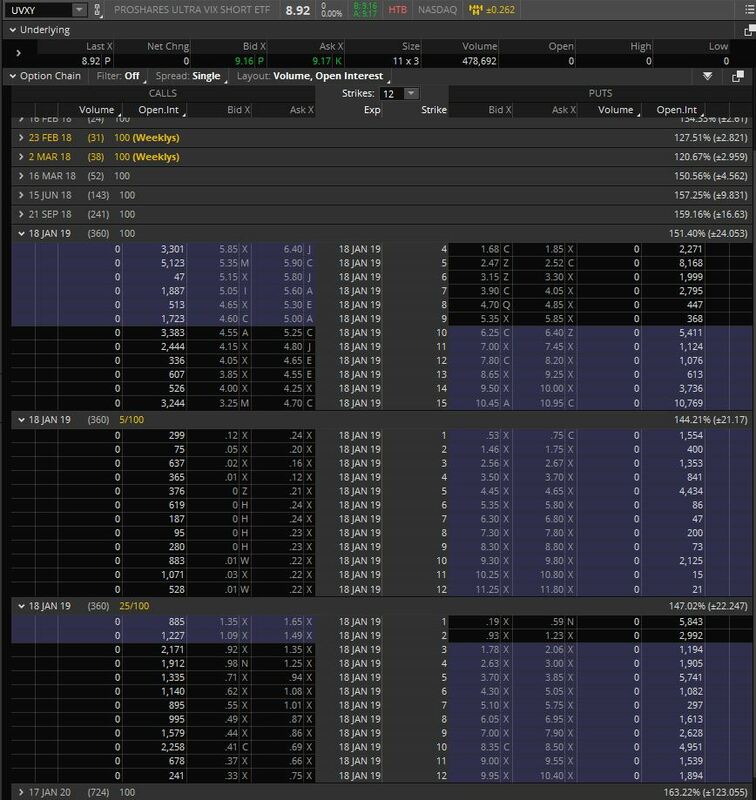 This is how looks the view of available expiration months on the ThinkOrSwim platform of the VXX instrument. 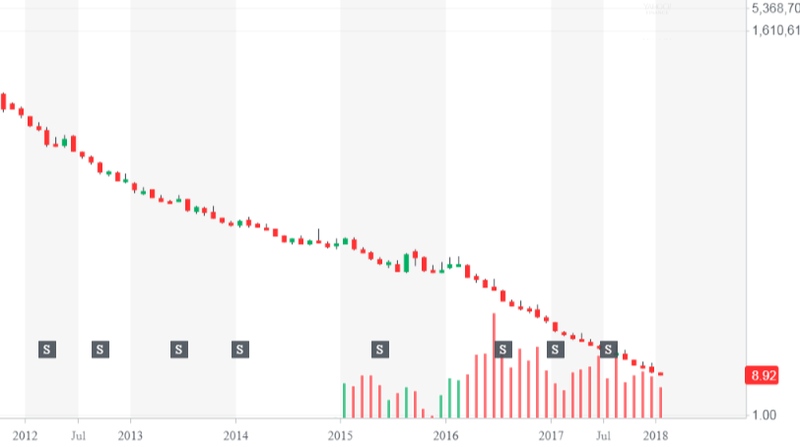 Those that still reflect the original value of VXX (before the reverse split) are marked yellow with a note 25/100 (ie, reverse split 1: 4), ie MAR18, JUN18 and JAN19. How often the split occurs? It can be said that there is a direct proportion between the decrease of the price of the underlying instrument and the number of reverse splits. VXX has split 5x for its existence, while its 2x leveraged “brother” UVXY has already split 8x, in 2012 and in the last year it was 2x, as you can see from the table above (source: https://www.splithistory.com ). 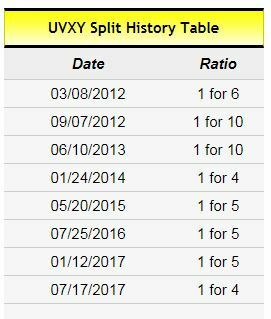 This is also shown in the following picture, which shows options for UVXY – expiration of JAN2019, where “options” have been linked to 3 different prices (from the top: actual, double split 5/100, that is 1:20,and the split 25/100, that is 1: 4). The current price is $ 8.92, the price before the split of 1:20 (1: 5 and 1: 4) would only correspond to $ 0.45 (under $ 1! ), the price before the last 1: 4 split corresponds to the current $ 2.07. This article was made to explain the issue of the reverse split, especially with regard to option trades. As you can see, there is nothing to worry about, the original contract simply stays and you have time to “roll” the position to a new contract, or to close the original trade and wait for a good entry for a higher premium on already new contract.